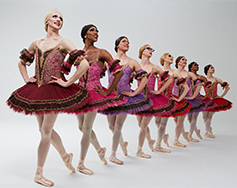 Founded in 1974 by a group of ballet enthusiasts for the purpose of presenting a playful, entertaining view of traditional, classical ballet in parody form and en travesti, Les Ballets Trockadero de Monte Carlo first performed in the late-late shows in Off-Off Broadway lofts. The Trocks, as the dancers are affectionately known, quickly garnered a major critical essay by Arlene Croce in The New Yorker which, combined with reviews in The New York Times and The Village Voice, established the company as an artistic and popular success. By mid-1975, the Trocks’ inspired blend of a loving knowledge of dance, impeccable comic approach, and the astounding fact that men can, indeed, dance en pointe without falling flat on their faces, was being noted beyond New York. Articles and notices in publications such as Variety, Oui, The London Daily Telegraph, as well as a Richard Avedon photo essay in Vogue, made the company nationally and internationally known.The 1975-76 season was a year of growth and full professionalization. The company added management, qualified for the National Endowment for the Arts Touring Program, hired a full-time teacher and ballet mistress to oversee daily classes and rehearsals, and made its first extended tours of the United States and Canada. Packing, unpacking, and repacking tutus and drops, stocking giant-sized toe shoes by the case, and running for planes and chartered buses all became routine parts of life. Not Yet a Paramount Member? CLICK HERE to Become One Today!